Our storytellers delved into familiar ground at the March 29 True Tales, Told Live event at Odie's Deli in Soldotna. The theme for the night was, "Sibling Rivalry, the Ties that Bind and Blindside." We had stories from Marissa Severson, Kristin Mitchell, Heddy Huss, Maura Schumacher, Ben Boettger, Matt Pyhala, Jacki Michels, Bruce Vadla, Sarah Pyhala and Liz Earl. This week's show is part one of that live event, with stories from Marissa, Kristin, Heddy, Maura and Ben, with a bonus musical performance by Wade VonHeeder and Ryan Hiler of the band, the Caper. The encees were Kaitlin Vadla and Jenny Neyman. Tune in to KDLL 91.9 FM at 11 a.m. April 13 for part two, with stories from Matt, Jacki, Bruce, Sarah and Liz. Connect with True Tales, Told Live on Facebook, or contact Jenny at KDLL at jneyman@kdll.org or 283-8433. Megan Weston, Jen Luten, Forrest Cohn, Scott Davis, Jill Davis, Jenny Neyman and Noah Procter share True Tales, Told Live on the theme "Risky rusiness — tales of taking the leap." Recorded Nov. 16 at Odie's Deli in Soldotna. 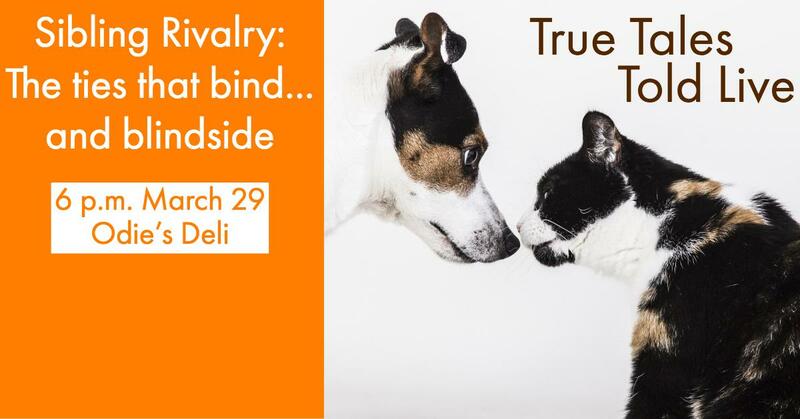 The next True Tales event is Feb. 1 on the theme, "Sibling rivalry — the ties that bind and blindside. Want to tell a story? Contact organizers through True Tales, Told Live on Facebook, or contact Jenny at jneyman@kdll.org or 907-283-8433. True Tales, Told Live is a storytelling group in the central Kenai Peninsula. Participants tell a true story, live, with no notes, based on the night's theme. The fifth storytelling event was held June 2 at Odie's in Soldotna, with the theme of "Nature vs. Not Sure."